I consider myself pretty savvy. I like to think that I know quite a bit about a lot of things, which is why I am always taken aback when I discover things that I should have already known about. That is exactly what happened to me recently, when I found out about Creative Baby and their wonderful line of learning products. While the name suggest that their products are only for babies, they offer so much more than that. Their interactive i-Mats and even simply activity cards take learning to the next level with the assistance of the incredible Voice Pen. 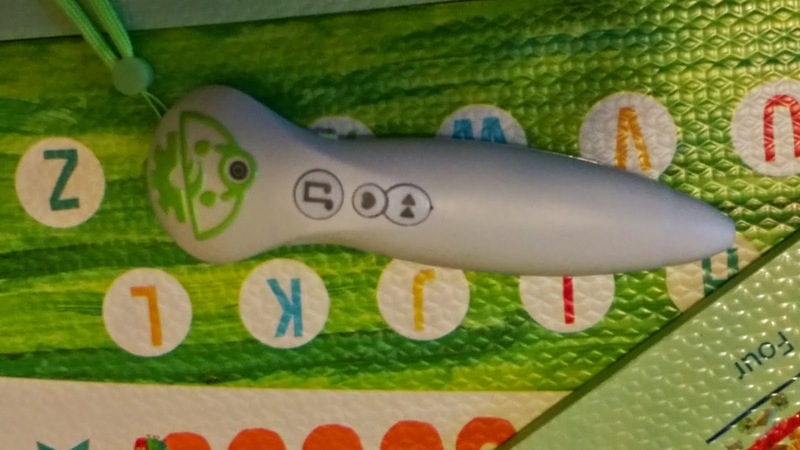 The Voice Pen is an easy to use handheld "pen" that plays adorable children's songs. You can even download you own music. 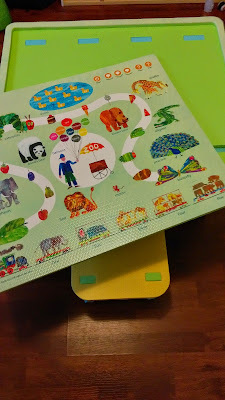 The Voice Pen is really at its best, though, when paired with other Creative Baby learning products like Activity Cards, i-Mats and The World of Eric Carle™ Interactive Table + Chair. 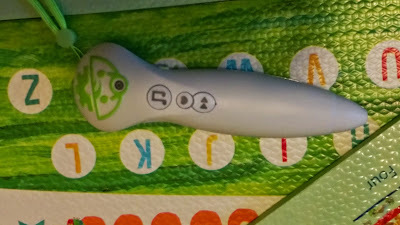 When paired with such items, the Voice Pen can play games, like trivia challenges where they will as a question that the child can answer by touching the pen to the correct choice. It can make the objects on the mat talk and such, and you(the parent) can even record custom messages for any of the items on the mat, controlling what the voice pen will say when they are touched. It can all be done in three different languages as well: English, Spanish and Mandarin Chinese. Not only is that wonderful for those whose native tongue is not English, it is a fun and easy way for children to begin to learn other languages once they have mastered the concepts in English. As wonderful as the Voice Pen is, The World of Eric Carle™ Interactive Table & Chair is what really drew me in. The Very Hungry Caterpillar is my all time favorite children's book. It was one of the first books I began reading to my son (and later on my daughter) and the very first book(besides baby board books) that my son learned to read on his own. And it is still his favorite book today. I even have a video of my son (who has autism and did not even speak until after he turned 3) reading The Very Hungry Caterpillar when he was 4 1/2. He is now nearly 8. My daughter is currently 3 and is not yet reading, but we are working very hard on it. The Very Hungry Caterpillar is the book we read together at least once a day. 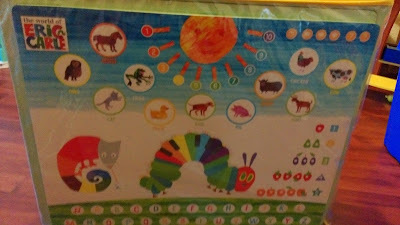 I knew that the The World of Eric Carle™ Interactive Table & Chair along with the Voice Pen would be so perfect for her. 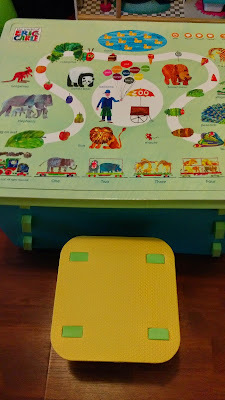 I was a bit nervous since the table and chair are made of foam and my little girl is not so little anymore, but once I assembled the table and chair, I knew I had nothing to worry about. They are very sturdy. I actually love the fact that they are foam now, as I don't have to worry about her crunching her toes or banging a corner or other such harmful things that I know she would find a way to do on something heavier and harder. What is reallygreat about the The World of Eric Carle™ Interactive Table & Chair is that there are two different mat that can be used for the table top, meaning twice the fun and learning activities. I wish I could get one of these big enough for my son too, because I know he would love it so much, but he is way to big(and knows all the things this teaches anyway). Since the mats come off though, I will try to let him play with those from time to time. That will not be easy though, because my daughter knows this is hers and she does not like to share. Besides that, she loves it so much that I don't think she will ever stop playing with it. I had to take a video, because I could never actually describe how she plays with this. She is a bit scattered, but she is having so much fun, and that is what matters. 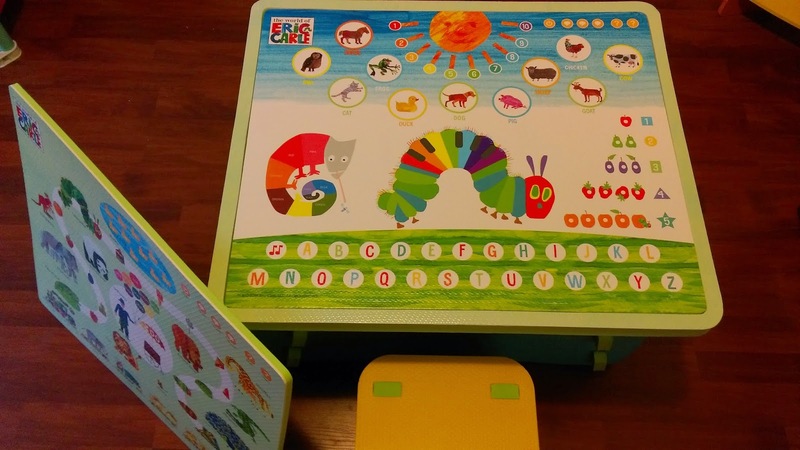 If you have a little one who is learning about letters, numbers, shapes and animals, the The World of Eric Carle™ Interactive Table & Chair and the Voice Pen would be the perfect way to help educate them while giving them their independence and letting them discover through play. Actually, any of Creative Baby's products will serve this purpose; their stuff rocks! Follow Creative Baby on Facebook and Twitter as well to stay up to date on all the latest product information. Latest JN0-102 dumps for JNCIA JN0-102 exam training. Download braindumps for JN0-102 and Pass Exam. Guaranteed JNCIA certification proven by Juniper certified IT engineers.